If you need a legal marriage before the real event, we can help you. We have performed countless legal wedding ceremonies before a larger planned event for various reasons. Nobody has to know and the license we issue you is completely confidential. We can marry you in a very quick wedding ceremony anywhere in California. Matricula Consular Card only if all required information is on the card. A valid Matricula Consular requires also that the individual provide a birth certificate translated into English. 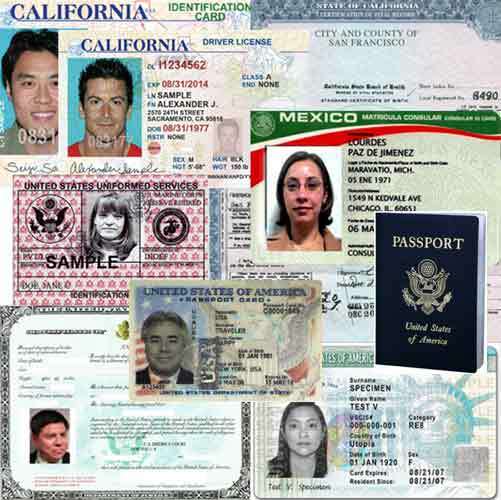 The various forms of ID that are accepted for a California Legal Marriage. If both spouses have the required identification, they must first purchase a valid Marriage License. Officiant Guy can provide that for you. Both spouses must be present to purchase a marriage license and the lines can be quite long and time consuming at the County Clerk’s office. 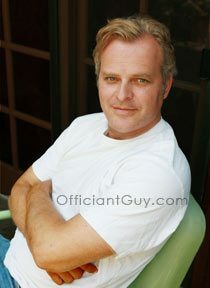 Let Officiant Guy do the work for you. A public license permits a couple to be married anywhere in the state and requires that at least one adult witness attend the couple’s wedding ceremony and sign the marriage license. This sort of marriage license is not recommended by the Officiant Guy. There are many reasons why. A confidential marriage license requires that the couple state that they are living together (but no proof of their living arrangement need be shown). Just a public license, a confidential marriage license permits that the wedding ceremony to take place within the State of California. No witnesses are required if the marriage license is confidential so the couple’s ceremony can be a true elopement and can be as short and private as they’d like. Unlike a public license, the information on a confidential marriage license does not become available to the general public after the wedding day. This is the kind of marriage license that the Officiant Guy issues. It’s really the best one. In Los Angeles County, a specially authorized notary public can issue the wedding couple’s confidential marriage license and deliver it to the couple so they do not have to brave the lines at the County Clerk’s office. A couple must have a marriage ceremony before their marriage license expires. A marriage license expires 90 days after the date is issued. No particular form of ceremony is required for a valid marriage and the ceremony can be as short and simple or as long and formal as you would like, however, each couple must express their agreement to be married and then the marriage must be pronounced by an authorized officiate. Often, a couple will call this type of marriage a “Document Signing Ceremony” to make it more clerical and less emotional. Officiant Guy understands this. He also provides the most precise service and the most expedient service because he hand-delivers the marriage license back to the County Clerk to make sure that it is indeed submitted and recorded as quickly as possible. This ensures that the wedding couple will receive their certified copies of their marriage license and certificate as soon as possible. Chris Robinson is the leading wedding minister in Orange County and Los Angeles County. 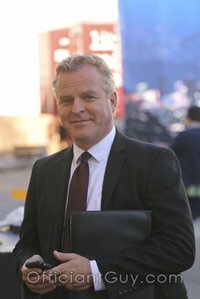 He’s also an attorney so he often deals with couples who would like to make sure that their marriage license is private and is recorded correctly.